Come as you are and be prepared to clap your hands, dance in your seat and laugh out loud, because you're about to be part of the show. I'm ashamed to admit that my family and I have only just recently experienced the award-winning, international box office sensation, STOMP, thrilling audiences at New York’s Orpheum Theatre. From the moment we entered the theater, the eclectic urban decor of the venue had my kids' full attention- it was random, it was fun, it was real. Above all we were excited to know that without a doubt, there would be no sitting quietly with our hands folded in our laps happening at the Orpheum Theatre. 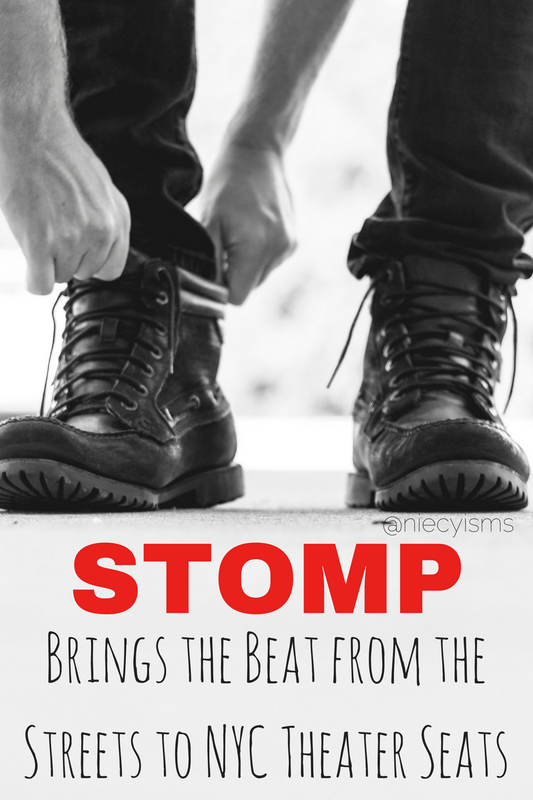 Thank you to the dynamic team from STOMP for a media invitation to attend a performance for the purpose of facilitating this advertorial content. The New York Times calls it "a sure-fire crowd pleaser with a rock-and-roll heart. " Bringing to the stage a complex combination of percussion, rhythmic movements and comedic talents, STOMP is family-friendly entertainment (recommended for ages 4 and up) that delivers so much more that ear candy. Multi-talented and high-energy performances from the stellar assembly cast creates living art that resounds long after the final curtain call. Believe me, my kids will NEVER simply sweep any room again, and I share this sacred mom confession- I am extremely anxious about bringing my 14 year-old into the supermarket or any retailer possessing shopping carts on the premises. The "creative" in me (and my talented offspring) watched with amazement the unified individualism of the accomplished cast members as ordinary and extraordinary objects were transformed into musical instruments. Far beyond an exceptional performance, audiences are exposed to a greater experience, the opportunity to see that anyone and anything can be so much more than originally purposed. There is real beauty in the world around us that is art, sometimes we need to shuffle it up, sometimes we need to STOMP it down. Either way... Support The Arts! USA TODAY said "STOMP finds beautiful noise in the strangest places." STOMP has been seen on TV shows ranging from The Academy Awards to Mister Rogers' Neighborhood to The London Olympics. It is a pulsating, witty, utterly irresistible theatrical event and has become a worldwide phenomenon, setting feet stamping, fingers drumming and adrenaline rushing for over 15 million people in 53 countries across five continents. New York, NY 10003. 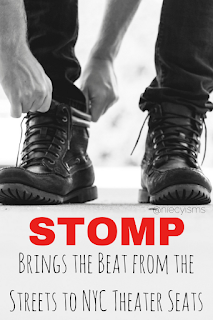 Be advised that the STOMP is performed without an intermission and children must be at least 4 years old to attend STOMP and everyone must have a ticket. The age minimum is enforced and no child under the age of 4 will be admitted.